Almost a year after their debut, Tasty has returned with a new single album and they don’t disappoint. 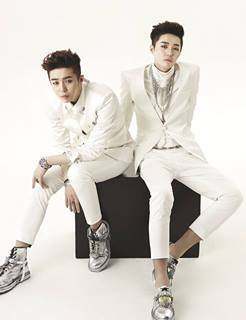 Comprised of twins Dae-ryong and So-ryong, Tasty was first touted as “Asia’s No.1 Performance Duo.” The twins didn’t quite live up to expectations but their latest single album is definitely a step in the right direction. Spectacular starts off with a great intro also named “Spectacular.”The electronic notes hide in the background and provide a build up to the horns. This combined sound adds an element of suspense to the song. “Spectacular” is reminiscent of soundtracks of heist/spy movies and this adds to the suspense and excitement of the song. When “Spectacular” reaches it’s peak, it takes the horns out of the forefront and showcases the electronic side of the song. This is a great segue because Tasty’s previous releases were extremely electronically dominated. Highlighting this shows that Tasty hasn’t lost their signature sound. At the same time, the use of the horns signifies a new musical direction and makes the listener eagerly await the next track. The next track, “MAMAMA,” is their single and it makes up for everything that “You Know Me” lacked. After being criticized for their singing and promising to show their best, Tasty has proved their critics wrong. Throughout the song, the music stops but the singing doesn’t; This gives the twins a chance to showcase their voices. If you listen closely you can hear a slight harmonization with the voice that is predominantly singing. It’s hard to tell if it’s the other twin singing or just an echo effect but it sounds good. The music is also great; Tasty describes this song as a swing/hip-hop mix but I think it also has some electro-pop influences. “Addiction” is the strongest song in terms of vocals. The track boasts a smooth RnB beat and Tasty shows a sultrier side to their voices. The music itself is simple but Dae-ryong and So-ryong’s voices are what make “Addiction” more than a forgettable RnB track. The twins even wrote the rap for the song themselves. I just wish the song had ended on a stronger note — it felt abrupt instead of smooth. Last on Spectacular is “2Nite” which features Han-hae from Phantom. This song actually should be named ” ‘2Nite’ by Han-hae feat. Tasty.” Han-hae dominates the song and the twins only sing the choruses. That said, it’s not a bad song. The chorus is the most memorable part and is infectiously uplifting. I can’t help but want to dance to the chorus. “2Nite” sounds like a mainsteam pop song that could air in the US; It certainly fits the trend of electro-pop that’s been dominating US airwaves recently. 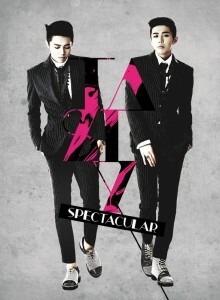 Spectacular is an improvement from Tasty’s first single album Spectrum while still remaining true to Tasty’s style. It’s curious to claim that a rookie group has a signature style but it’s evident that Woollim Label (formerly Woollim Entertainment) knows what direction they want to take Tasty. They’re aiming for an electro-pop danceable style with forays into RnB. It’s interesting to note that if you compare the tracklistings of Spectacular and Spectrum, they are structured nearly identically. Both begin with a strong intro that sets up the mood for the rest of the album. Next is the single of the album that embodies an electro-pop style with other musical influences. After the single is the RnB influenced track and lastly comes the musical experimental track that doesn’t stray too far into new territory. What Spectacular manages to do better, though, is to showcase Tasty’s voices. “MAMAMA” and “Addiction” are very different songs yet the twins’ voices shine in both. Part of this is due to the fact that Dae-ryong and So-ryong have pleasant voices. This adds to their vocal flexibility and that’s why they can pull of an EDM track and an RnB track in the same album. Of course, Tasty won’t be singing ballads anytime soon. Granted, their style isn’t suitable for ballads, but I’m curious about their vocal ranges and such. Their progress has shown that they can improve and they have a flexible style that could be expanded upon. It will be interesting to see if they stay in their safety zone, style-wise, or branch out. Regardless of if Tasty can sing ballads or not, they have a great sound going right now that fits their image. Spectacular is a wonderful single-album that showcases Tasty’s singing abilities and furthers their musical style. Though their songs can get repetitive, it seems to be part of their style and actually isn’t that big of a problem. In the future, I hope Tasty expands their sound and (hopefully) drops a full album. Until then, we’ll have to make do with Spectacular which, I must admit, is a strong single-album.